Everyone watches TV sometimes. Thus, to be able to speak about what they watch students need some specialised vocabulary. 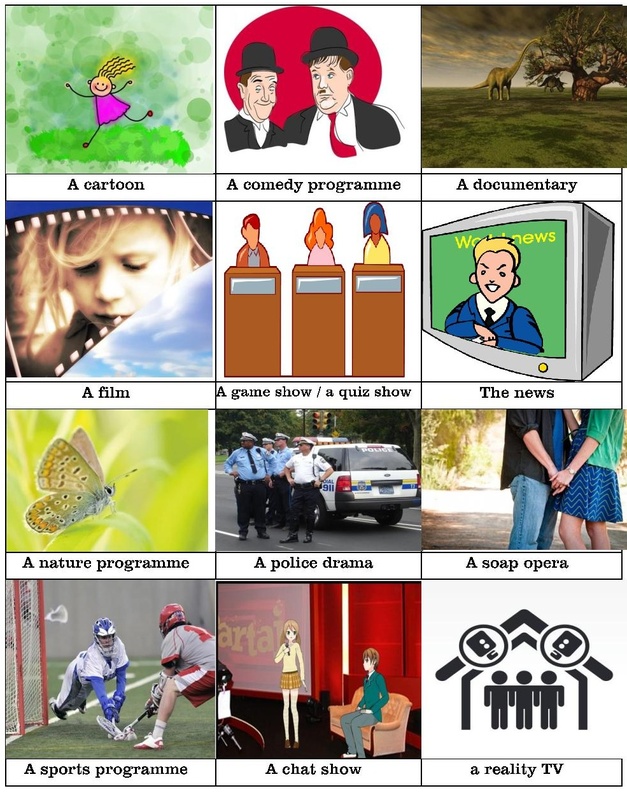 The aim of the following post is to introduce and teach 13 names of TV programmes. To achieve this, we have prepared the following activities: a video, a mind map, a pictionary and two games to practise the vocabulary you have learnt. Watch the following video and repeat the words. Go through the video as often as you feel necessary to remember all the words for the TV programmes. Once, you feel that you know all the necessary vocabulary, it is a good idea, to print out the following mind map and complete it with all the words you remember. Try to add the names of some real TV programmes you watch too. For example write a comedy programme to the picture of Laurel and Hardy and write there Friends, too. Write the words you have learnt and examples of the programmes you know. Now you have a chance to practise your knowledge in a playful way. The first quiz is fully in HTML5 so it should play on your mobile devices too. Try to solve the quiz by matching the words and the pictures and by writing the appropriate words to the pictures. If you pass you will play the game called angry Farmer. My best result has been 25. Will you be better than me? The second game is going to play only on your desktop as it is in flash. The name of the game is Half a minute and your task is to unjumble the words. Good luck. Thank you. I am glad you like this vocabulary activity. There are more on Clothes, towns and many others at our site. Check them out too. Very helpful, thankful. I can use these sheets for teaching my kids English…..